In addition to providing pipe leak detection for businesses and commercial properties in Cheshire, Cheshire plumbers are also experts at working on plumbing issues in homes. A pipe leak can be devastating to your home, creating not only water damage, but also causing the pressure to drop to such an extent that the boiler cuts out. Water damage can be costly to repair, and the lack of a boiler can be a massive inconvenience to a household making it difficult to shower and keep warm. It’s therefore essential that should a problem arise, you call a plumber as quickly as possible. Here at Cheshire Plumbers we have a long experience working with leaks, and so know the disruption that finding a leak can sometimes cause. 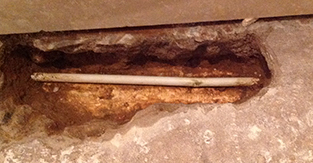 This is why we use cutting edge pipe leak detection equipment to quickly find and isolate the leak – meaning that only the actual area needs to be disturbed to fix it. Our pipe leak detection techniques include thermal imaging; this monitors the escaping heat in the walls or under the floor, allowing the area to be pinpointed. Our staff are highly trained in pipe leak detection and are ITC certified thermographers so you can be assured of a quick, reliable and high quality service at affordable prices. If you would like to find out more about our pipe leak detection for your home or business then please get in touch with a member of our team. We can provide you with a no obligation quote and advise you on which of our services is best suited to your needs. In addition to pipe leak detection we also provide underfloor heating, solar heating, bathroom, gas, plumbing and heating services.